The Junior League of Tulsa (JLT) is fortunate to have a Community Advisory Board that advises the League on affairs that affect the community—with particular emphasis on the status of its projects, strategic plan, and overall goals. The members of our advisory board offer a variety of experiences and expertise, providing invaluable insight. We sat down with Community Advisory Board member Karen Larsen to learn more about her work in Tulsa and why she chooses to be involved with JLT. 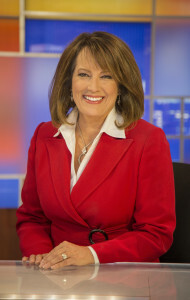 Karen is an award-winning news anchor for KJRH Channel 2, and she’s a mother, wife, and nonprofit advocate. Read on to see what she had to say! JLT: How would you describe Tulsa in one word? Karen: Giving. This is the most generous community I have ever seen. When people are in need, Oklahomans dig deep and give generously to help. JLT: Use three words to describe yourself. Karen: For nearly 20 years, I have been involved with Oklahoma Project Woman and its Pink Ribbon fashion show events. The mission to provide free mammograms and breast health care to women in need is especially dear to me after losing my mother to breast cancer on the eve of Mother’s Day nine years ago. I’ve enjoyed hammering on a Habitat for Humanity home, sharing heart health tips for the American Heart Association, and standing on a curb in front of the KJRH studios to raise money and food donations for “Food 2 Families” every winter. Rain and snow don’t stop us! I am fortunate that the parent company of 2 Works for You generously supports employee volunteerism. The Scripps Foundation has given cash grants to many of the causes I work on, such as the Community Food Bank of Eastern Oklahoma, Aim High Academy, and Lindsey House to name a few. I am currently writing a grant request for JLT’s literacy project, so keep your fingers crossed! Most recently, I was honored to serve as honorary chair and emcee for Assistance in Health Care Tulsa, which helps cancer patients pay their bills while undergoing treatment. Someday in the future, I plan to find time to volunteer to teach adults how to read. Books are a lifelong passion that I would like to share. In the meantime, I enjoy sharing advice and expertise to help nonprofits expand their reach through news outlets and social media. JLT: How long have you been involved with JLT? Why do you choose to be involved? Karen: I have been fortunate to serve on the Community Advisory Board (CAB) for the past three years. It is an honor to be invited since I consider the women of the Junior League to be supremely organized and dynamic artists of change already. Every meeting is filled with collaborative effort, insight, and effective brainstorming, with the additional bonus of learning from the expertise of other CAB members. JLT: What’s your favorite experience with the Junior League of Tulsa so far? Karen: Visiting JLT project sites such as Street School, and learning the depth and scope of the initiatives this agency has developed. I will never forget meeting the students of Street School and hearing them talk about learning such basic yet vital skills as cooking and tying a tie properly. When you hear so many of them discuss their terribly dysfunctional homes, it’s obvious that the skills they are learning will change and impact their lives forever. JLT: What are your words to live by? JLT: What’s your favorite Tulsa activity? Karen: It’s impossible to narrow it down to one thing. I love visiting Tulsa parks, exploring restaurants in Tulsa’s thriving downtown districts, hunting through antique shops, enjoying Broadway shows at the PAC, or simply having coffee with girlfriends at Utica Square. We have so many great choices. JLT: Why do you think it’s important to be involved in nonprofit work? Karen: When you call a place home, I believe we all have a responsibility to do what we can to reach out and make it better. Whether you choose to open your checkbook and give money, work on a community project, a Day of Caring, or even something as simple as shoveling snow from an elderly neighbor’s walkway or picking up trash you find at the park, by simply being aware of a need and taking the time to help, we improve Tulsa. JLT: What advice would you give someone who wants to give back to the community while balancing their other responsibilities? Karen: Remember that your effort doesn’t have to be something that makes headlines or lasts decades. Simply helping for a few hours or a day can make a difference. Be sure to involve your children. When mine were little, we planted a garden, nurtured the plants, and then packed up their produce. Seeing them proudly carry baskets of herbs and veggies to the neighbors—then generously share what we nurtured and grew as a family—remains a priceless memory and a first lesson in community giving.